Screen grab from the Dec. 4, 2018 episode of The Price is Right featuring Providence resident Kayla Elgan. 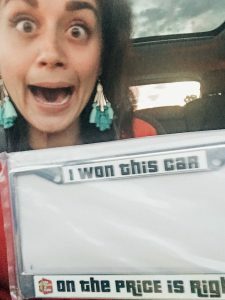 A Providence woman is still reeling, months after becoming a contestant on The Price is Right and winning a number of prizes, including a car. “Come on down!” Three words, 27 year-old Kayla Elgan waited most of her life to hear. 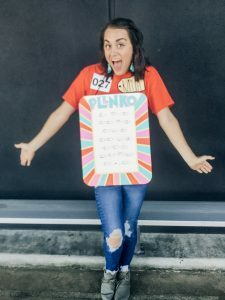 Elgan says she spent her childhood watching The Price is Right with her mother and grandmother and dreaming of someday becoming a contestant. That dream came true this past September when she scored tickets to a taping of the show. 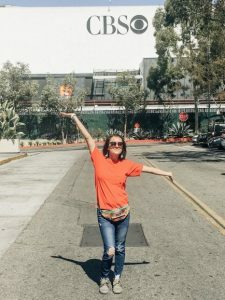 With her husband and young son in the car, the family headed to California for a mini vacation and a chance for Elgan to score it big on her favorite game show. In the show, contestants compete to win cash and prizes by guessing the pricing of merchandise. You start out by getting called to be on Contestant’s Row, which was just the beginning for Elgan. On Contestant’s Row, you are one of four players attempting to bid on an initial prize. You win the prize if you are closest to the amount without going over. 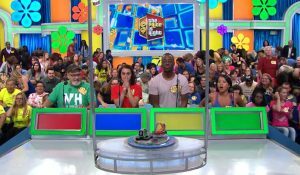 It took Elgan four tries, but she eventually won a flat screen TV and the chance to go on stage with host Drew Cary and play another pricing game. The next pricing game for Elgan was called Line ‘Em up: a game which is played for a car, plus three additional prizes. Elgan’s initial prizes included a tire inflator, 52 weeks of take-out meals and 52 weeks of car washes. Then she was shown the car, a 2018 Hyundai Accent. Elgan did not make it to The Showcase, which is the final pricing game. However, she was thrilled just to have been on stage and taken part in the experience. More than six hours passed from the time she arrived at Studio 33 in Hollywood until she was able to call her family and tell them the exciting news. Elgan said she had to FaceTime her husband and show him the prize receipts before he would believe her. When you talk with Elgan, it’s clear her bubbly personality helped land her a spot on the popular CBS game show. However, she would have to keep that enthusiasm under wraps for a couple of months. Elgan could tell family and close friends she won prizes, but was not allowed to post anything on social media until the show aired on December 4th. She hosted a watch party at her local church with family and friends to commemorate the event and watch a replay of the show. Elgan figures she won about $20,000 in prizes and was told to expect their arrival after the show aired. She’s hoping to see the new car and other prizes by the first of next year. To see the episode with Elgan as a contestant, click here.